Dear SUNBURN GOA, even we are a part of India. #ArentweINDIA? Just a few days back the national capital of India celebrated the North East Festival with an objective of connecting people and lives. Residents of Delhi and NCR joined hands to celebrate the uniqueness of the North Eastern part of India, showcased the immense talent and potential of the region and strongly condemned the feeling of alienation which the residents of this part of India always complain of. Barely days after such a noble initiative, a very established electronic music festival of India, Sunburn shared a poster on Facebook promoting their flagship event Sunburn Goa. The creative of this post depicted vibes travelling from all over ‘India’ and heading towards Goa. But there seems to be little difference of opinion as to how the map of India looks like to the organizers of the festival as they have cropped out the entire North Eastern part of the country. Isn’t this a little outrageous or rather insulting to the entire North Eastern population of the country? Alongside North East, they have also ignored Andamans and Nicobar Islands and the Lakshadeep Islands in the map. And this is just sad. What is ironical here is that during same an Indian music festival, organized by a Mumbai based Entertainment Network, used a creative with a wrong map of India. And the media went around criticizing what happened abroad. What makes the whole situation even more sad is the fact that despite being pointed out by numerous users, the post has not yet been taken down and no formal or proper apology has yet been issued by the organizers. Sincere apologies to all our friends from North East India. This social media graphic was just for to show the vibes are coming from every part of the country - we didn't have any intention of missing any states or part of the country. Its just a visual representation. As a brand - Sunburn is INDIAN and its because of each and everyone of you from every corner of India. We will make sure we include everyone the next time we put up a map of India. We love you all!! Just a visual representation? We will include everyone the next time we put up a map of India? Well, whoever is the admin of the page, he must note the fact you have no authority as to the inclusion or exclusion of any part in a map. It’s pure common sense that if you use a map, it has to be correct. The point here is not just the legal aspect of misrepresenting the Indian map. The intention here is to make the organizers and the administrators of the page understand the sentiments attached with the map of India. Cropping an entire region out and especially a region which has been in news for being alienated from the country just adds fuel to the issue. What makes this act further unjustifiable is the fact that even after 9 days of the post and numerous comments against, the picture is not yet taken down and no regret or shame has yet been showcased by the organizers. The region holds no grudge against the organizer or the event. Goa is one of the most visited tourist destinations in India, forever flocked by tourists from abroad and Sunburn Goa has been ranked one of the best Music Festivals of the world by CNN. Hence, the insult of an entire region at such a big platform should not be taken likely. 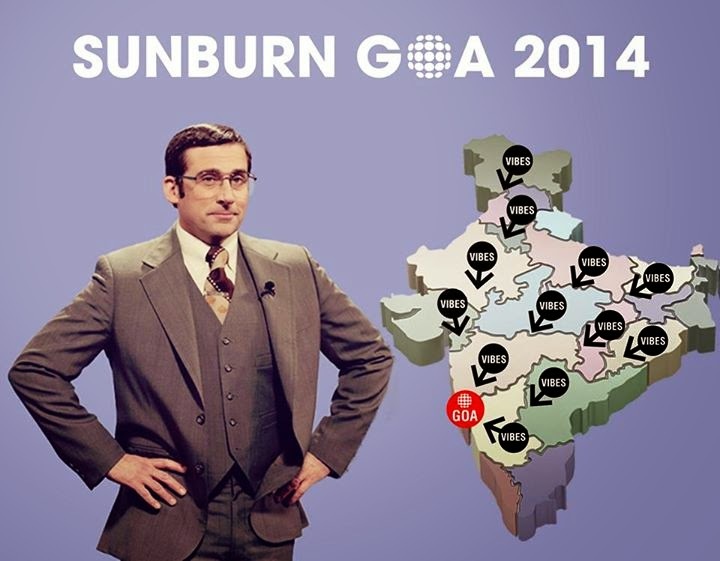 To conclude, just a message, Dear Sunburn Goa, even we are a part of India. #ArentweINDIA? Thanks to the movement initiated by Kaushik Jai Barua, your's truly and numerous friends of North East, SUNBURN Festival has taken the offensive picture down (After 10 Days) and 10 hours after this post. They have uploaded a new a creative with a small apology. We sincerely hope such incidents do not get repeated again.